Cannabis smoking is the inhalation of smoke or vapors released by heating the flowers, leaves, or extracts of cannabis and releasing the main psychoactive chemical, Δ9-tetrahydrocannabinol (THC), which is absorbed into the bloodstream via the lungs. Cannabis (marijuana) can be smoked in a variety of pipe-like implements made in different shapes and of different materials including hand pipes ("bowls"), water pipes ("bongs"), cigarettes ("joints"), or blunts. When smoking a joint or blunt with someone else or a group of people, it is common courtesy to take no more than two inhalations ("puffs", "pulls", "hits", "rips") then pass it on. With a pipe, bowl, bong, or vaporizer, one inhalation is the norm. Joint is a slang term for a cigarette filled with cannabis instead of tobacco. Alternatively, mainly in Europe, joints may contain tobacco (commonly dubbed "a spliff", but not to be confused with the Jamaican term Spliff, which refers to a large joint) or various non-addictive herbs. Sometimes a joint will contain kief or hashish; hashish can be heated and made to crumble before placement within the joint. Specially manufactured rolling papers are most often used in industrialized countries; however, recycled brown paper and newspaper are commonly used in the developing world. Modern papers are now made from a wide variety of materials including rice, hemp, soy, and flax. A joint typically contains 250–750 mg net weight of cannabis and/or fillers. "Pinchie" redirects here. For the town in Canada, see Pinchie, British Columbia. For a device used for a single serving (usually 25 mg), see One-hitter (smoking). Pipes made for smoking cannabis, sometimes called pieces or bowls, are made of a variety of materials, including metal fittings, ceramic, borosilicate glass, stone, wood, bamboo among other materials. Subtypes include one-hitters, bubblers, chillums, glass blunts, corn cob pipes, and standard hand pipes. 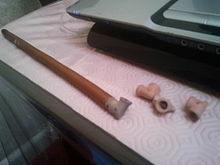 Pipes vary greatly in shape and materials, and most are handmade. The common thread between them is having a narrow screened receptacle ("bowl"), a "stem" (which may be a long flexible tube as on hookahs and vaporizers), and a "mouthpiece". The smoking material is placed in the receptacle and affected with a heat source while air is drawn through the bowl and stem to the user. A bubbler is a mix of a bong and a pipe. They tend to look like small bongs and are another way to smoke cannabis. A bubbler contains a chamber for water, commonly with a down stem directly connected to the bowl of the piece. A bubbler normally has a dedicated carburator, a hole which is usually covered with the finger then opened for mixing clean air with the smoke to make inhaling easier. Because of the carburator there is no need to pull the stem as you would with a bong. 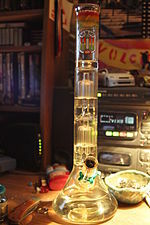 A gravity bong (also known as a grav, bucket, submarine, geeb, or GB) is a hydropneumatic device used for smoking cannabis. One variant consists of a bucket of water in which is typically placed a bottle with the bottom cut off, such as a 2-litre PET soft drink bottle. Some kind of cap or screen is rigged over the mouth of the bottle and filled with hash or cannabis. A flame is then held near enough to heat the drug while the bottle is slowly raised out of the water, creating a negative gauge pressure inside the bottle, drawing smoke from the heated cannabis—along with air—into the vacuum. The cap or screen is removed once the bottle is almost full, the user's mouth is placed over the mouth of the bottle and the bottle pushed back down into the water, causing the pressure to rise and forcing the smoke into the lungs. There are many variants on this basic premise, such as using a large water cooler tank in lieu of a soft drink bottle. Similar to a gravity bong, a waterfall bong utilizes both a bottle and a cap or screen rigged over the bottle's mouth to hold cannabis. In this case, however, the bottle—which has one or several holes drilled near or at the bottom—is either filled with water or placed in a larger container filled with water before the cannabis is packed. The holes are then uncovered, or the bottle is simply raised from the container, evacuating the water either onto the ground or back into the container. When heat is applied to the drug, the resultant smoke is forced into the bottle with negative gauge pressure, as with the gravity bong. Once the water is evacuated, the smoke can be inhaled from the bottle. Variations on this concept are also used. Vaporizers (vape pens and/or stationary platform) are devices used to extract the active ingredients of cannabis, tobacco (E-cigarettes), or any plant material at lower than burning temperature, eliminating carbon monoxide and carcinogenic "tars" found hazardous in smoke. [medical citation needed] 197 °C / 385 °F is frequently mentioned as a good vaporizing temperature for favored cannabinoids. Utensils usually thought of as smoking pipes can be used to vaporize if the receptacle, or "bowl", is narrow enough to permit controlling the inward flow of heated air from a source such as a lighter which is held far enough below the opening. According to the journal Clinical Pharmacology & Therapeutics, vaporizing cannabis is a safe and more effective way (than smoking) of delivering THC to patients for medical uses. The feasibility of vaporization of THC has been demonstrated in a series of laboratory studies involving different vaporizer designs. An electric vaporizer was shown to release substantial amounts of the THC while producing no measurable amounts of the benzene, toluene, and naphthalene, which are generated when marijuana is smoked. A 2013 literature review said that exposure to cannabis had biologically-based physical, mental, behavioral and social health consequences and was "associated with diseases of the liver (particularly with co-existing hepatitis C), lungs, heart, and vasculature". The authors cautioned that "evidence is needed, and further research should be considered, to prove causal associations of marijuana with many physical health conditions". ^ "Herbal alternatives". Wikiversity. Retrieved 25 June 2015. ^ Brown, Jessica E.; Luo, Wentai; Isabelle, Lorne M.; Pankow, James F. (2014-06-05). "Candy Flavorings in Tobacco". New England Journal of Medicine. 370 (23): 2250–2252. doi:10.1056/NEJMc1403015. ISSN 0028-4793. PMID 24805984. ^ Abrams, DI; Vizoso, HP; Shade, SB; Jay, C; Kelly, ME; Benowitz, NL (November 2007). "Vaporization as a Smokeless Cannabis Delivery System: A Pilot Study". Clinical Pharmacology. 82 (5): 572–578. doi:10.1038/sj.clpt.6100200. PMID 17429350. ^ Dale H. Gieringer. "Cannabis "Vapoization : A Promising Strategy for Smoke Harm Reduction" (PDF). Cannabis-med.org. Retrieved 9 April 2018. ^ Abrams, D. I.; Vizoso, H. P.; Shade, S. B.; Jay, C.; Kelly, M. E.; Benowitz, N. L. (2007). "Vaporization as a Smokeless Cannabis Delivery System: A Pilot Study". Clinical Pharmacology & Therapeutics. 82 (5): 572–578. doi:10.1038/sj.clpt.6100200. PMID 17429350. ^ Gordon AJ, Conley JW, Gordon JM (December 2013). "Medical consequences of marijuana use: a review of current literature". Curr Psychiatry Rep (Review). 15 (12): 419. doi:10.1007/s11920-013-0419-7. PMID 24234874.